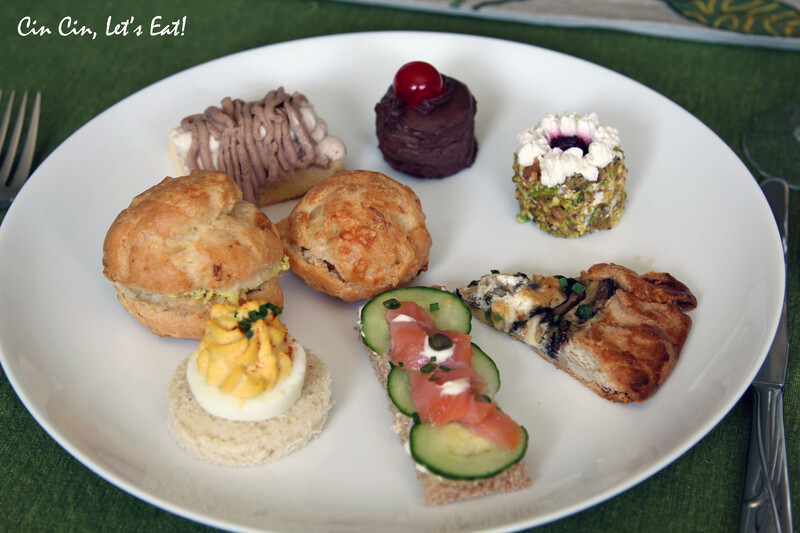 Tea Party 2013 [recipe] – Cin Cin, Let's Eat! 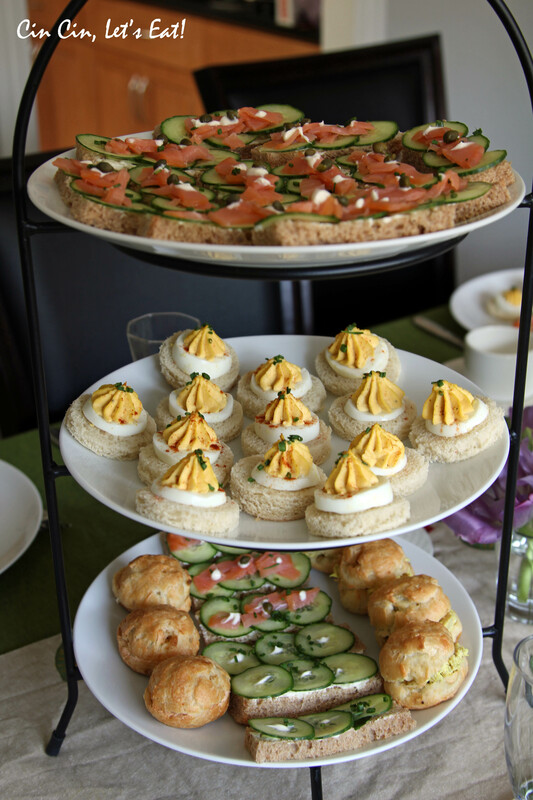 Anyway, it’s always a great time to experiment with new recipes and decorating techniques, and then stuff ourselves silly with copious amounts of savory and sweet treats (and mimosas) with our dear friends. similar recipe, different presentation here and here. Wash cucumbers. Using a mandolin set to the thinnest setting and slice the cucumber to thin rounds. Once thinly sliced. Reserve 2 tablespoon of creme fraiche. Mix the remaining cream fraiche with softened cream cheese in a medium size mixing bowl. Whisk until well combined. Refrigerate for 30 minutes. Cut off 4 sides of crusts on each slices of bread, then into 2 rectangles. Note that the bread slices dry out quickly, so if you are doing this ahead, cover them with plastic wrap and store in airtight container. Spread the creme fraiche mixture onto one side of each rectangle bread slice. 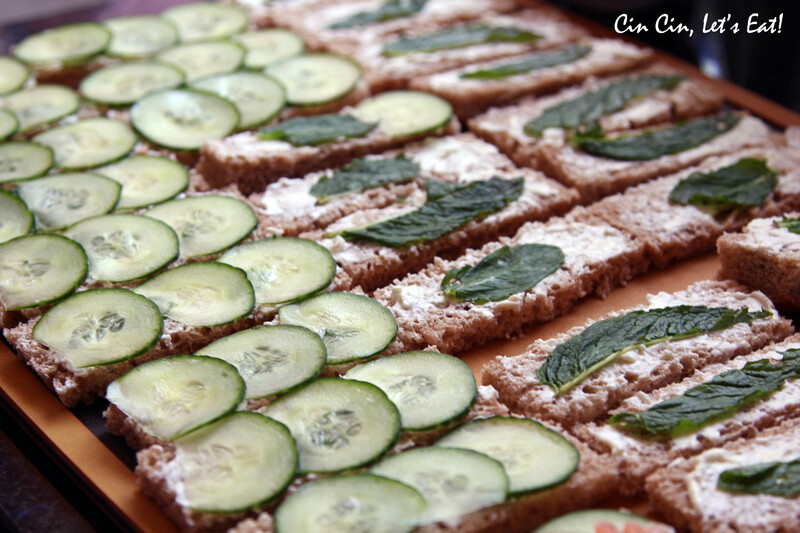 Place one or two mint leaves on each rectangle, then neatly place the slices of cucumbers on, slightly overlapping each slices. 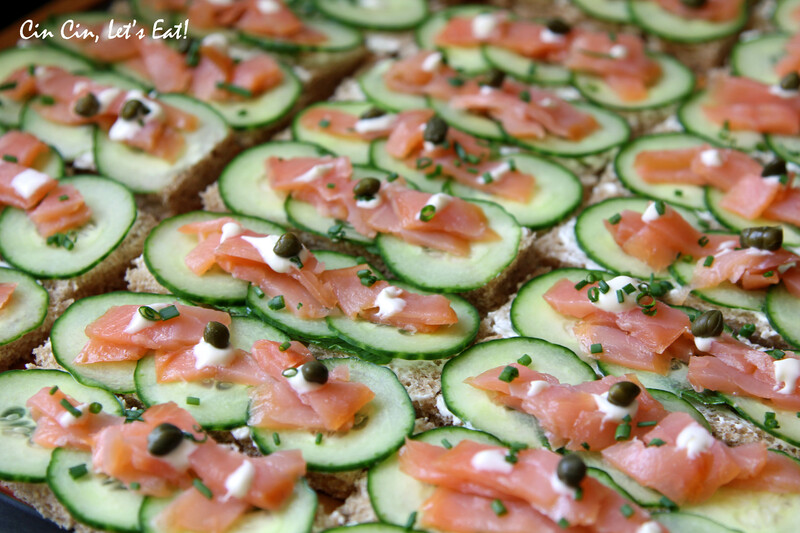 Place a small dollop of creme fraiche/cream cheese mixture on each sandwich as glue for the smoked salmon. Place a small mound of salmon on top of the bread. 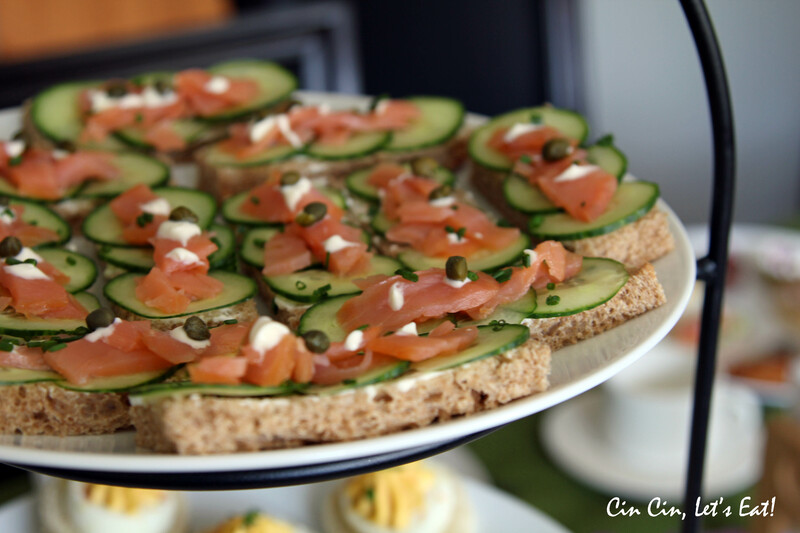 garnish with reserved creme fraiche, capers, chives, mint leaves…etc. Deviled egg mixture recipe adapted from Simply Recipes, swapped out onion and shallot and added 1 tsp of dried onion powder. Go for a smooth velvety mixture because you don’t want the chunks of onion to get stuck inside the piping tip. First hard boil the eggs. Fill up a large saucepan half-way with water and gently add the eggs. Cover the eggs with at least an inch of water. Add a teaspoon of vinegar to the water (this will help contain egg whites from leaking out if any of the shells crack while cooking). Add a pinch of salt to the water. Bring the water to a boil. Cover, and remove from heat. Let sit covered for 12-15 minutes. Drain hot water from pan and run cold water over the eggs. (At this point if you crack the egg shells while the eggs are cooling, it will make it easier to peel the shells.) Let sit in the cool water a few minutes, changing the water if necessary to keep it cool. Peel the eggs. Slice each egg into 6-8 slices, crosswise. 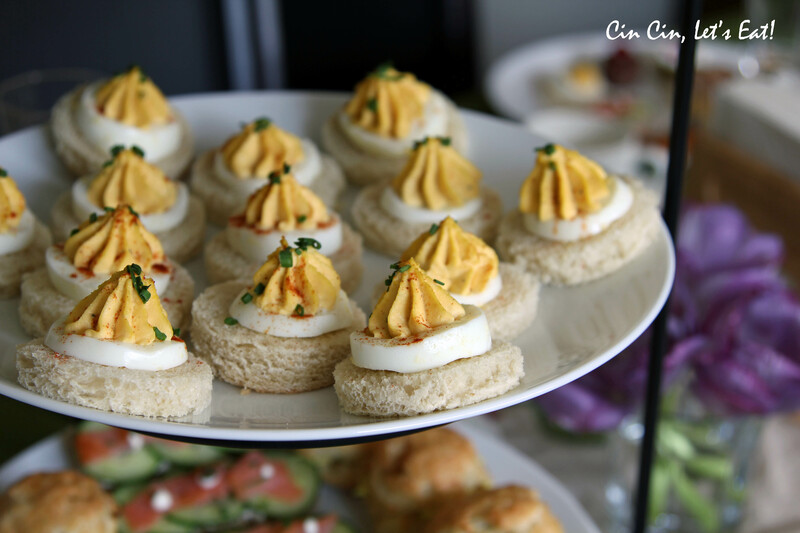 Use an egg slicer for more uniformed slices. Gently remove the yolks and place in a small mixing bowl, reserve the rings of egg whites. Using a fork, mash up the yolks and add mustard, mayonnaise, onion powder, Tabasco, and a sprinkling of salt and pepper. Put the mixture in a piping bag fitted with a star tip. Refrigerate until ready to use. To assemble: Spread one side of each bread circle with butter. Top with an egg white ring. Pipe the egg mixture. Garnish with a sprinkle of paprika and chives. Recipe from the Kitchen Witch Blog. Place your racks in the upper and lower thirds of your oven and preheat to 375 degrees F. Line two baking sheets with parchment paper and set aside. In a large saucepan, combine water, and butter over medium high heat. Continue to cook, stirring, until butter has melted and mixture has come to a boil. Reduce heat to medium low and add flour all at once, using a wooden spoon, stir vigorously until the mixture pulls away from the sides of the pan, about 30 seconds. Continue to cook and stir for an additional 1 1/2 minutes to remove more moisture. Remove from the heat and allow to cool slightly for about 3 1/2 minutes. 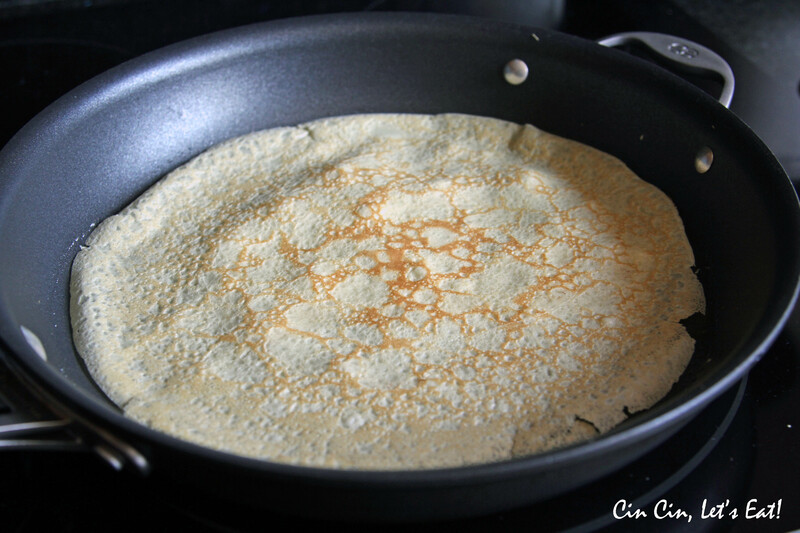 Add your eggs, one at a time, beating each egg into the mixture until it is incorporated. The batter will appear to separate at first, but will then come together in a dough. Continue adding the eggs one at a time until the dough is glossy and just stiff enough to hold peaks, but pliable enough to fall softly from a spoon. This may or may not require the last egg, so monitor your dough accordingly. 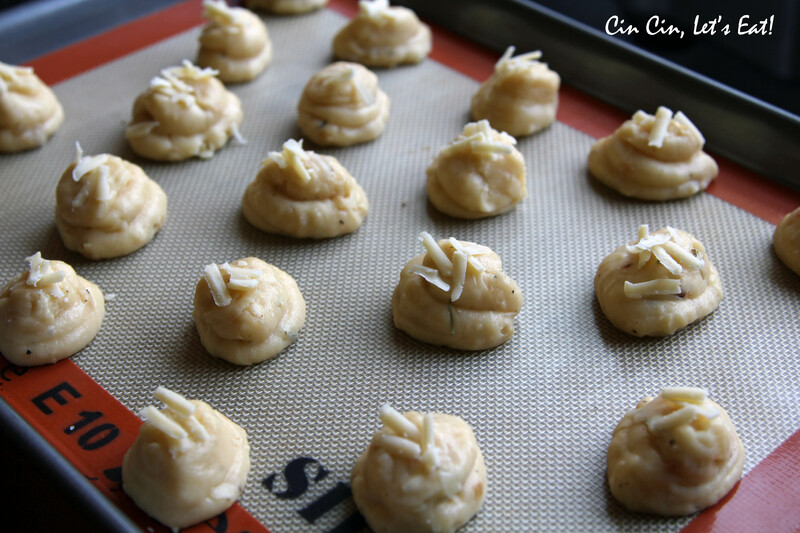 On a cutting board, with the edge of a chef’s knife, smash the roasted garlic with the kosher salt to form a paste, add to the choux. 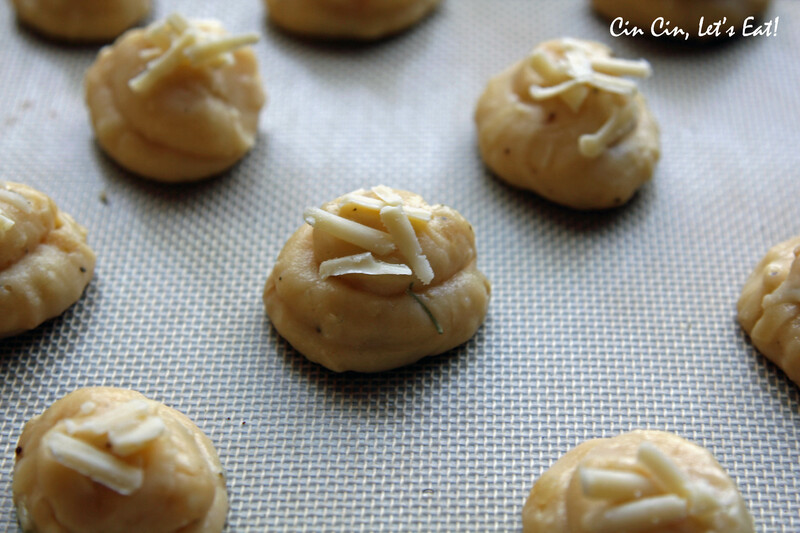 Stir in 1 cup of the cheese, pepper, and rosemary until well incorporated. Fill a pastry bag (or zipper lock bag with a snipped corner) with the dough and pipe 1-inch rounds onto your baking sheets, approximately 1-inch apart. Continue until you have used all the dough. 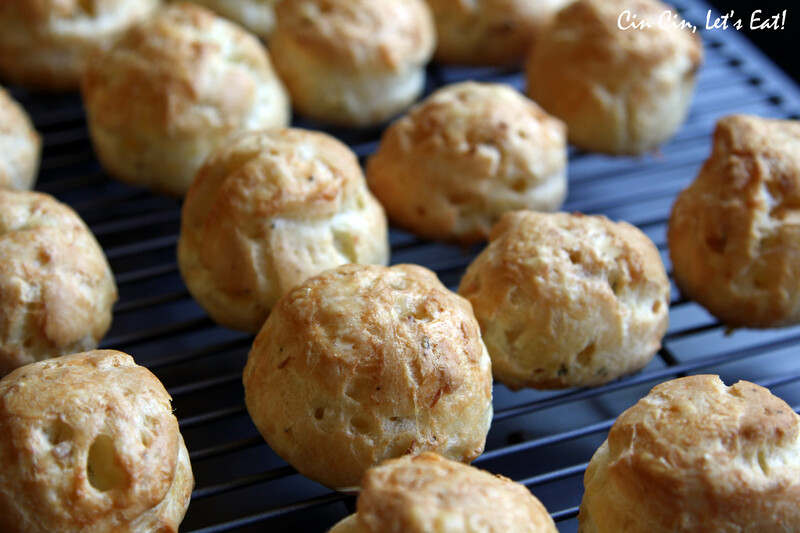 Bake in the oven, switching positions of your sheets half way through, until the gougères are puffed, golden, and crisp, about 30 minutes. Serve warm. 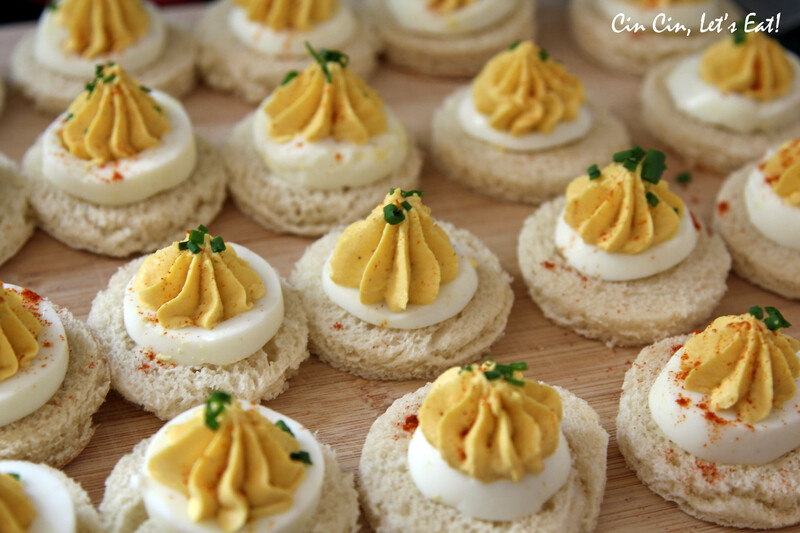 These were served with curried chicken salad and for the vegetarians, a store bought sun-dried tomato cheese spread. I used the mushroom and cheese mixture from the link above, and used two store-bought pie dough to make two galettes. Thaw out the pie dough if it is frozen. In a bowl, beat together the cream cheese, sour cream, egg and grated parmesan. Season with salt and pepper. Heat the olive oil with the garlic (remove the garlic after the oil gets flavored) in a non stick pan and slightly fry the mushrooms. Add the chopped parsley and remove from the flame. 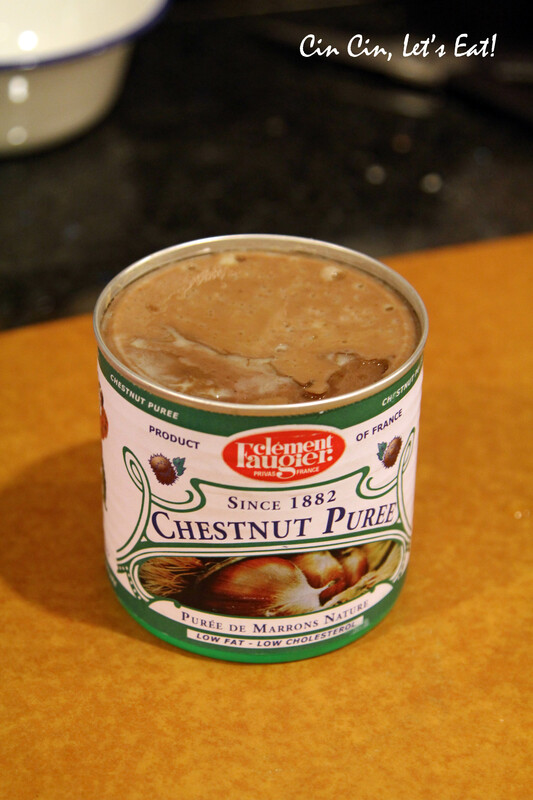 Once the mushroom mixture is cooled, combine with the cheese mixture. Unroll the thawed pie dough, give it a light dusting of flour and go over it with a rolling pin, fix and mend holes if any. Transfer to a lined baking sheet. 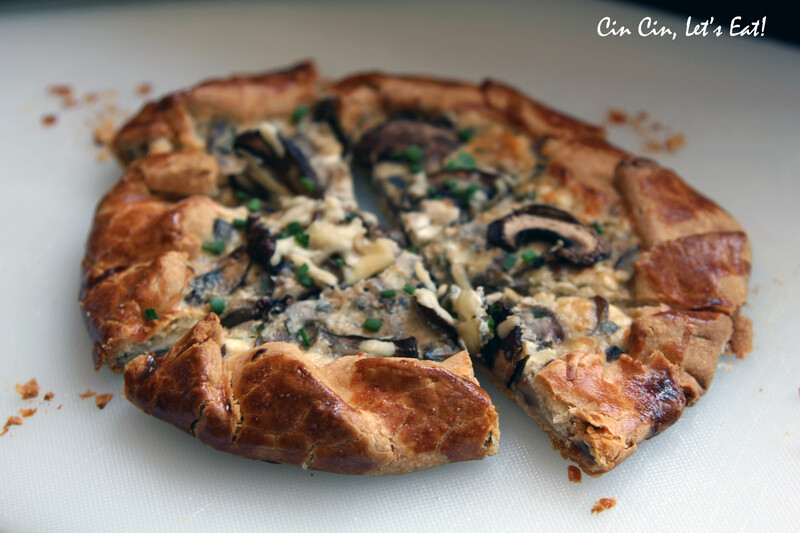 Spread the mushroom and cheese mixture on the pie crust, stopping within 1 inch of the edge. 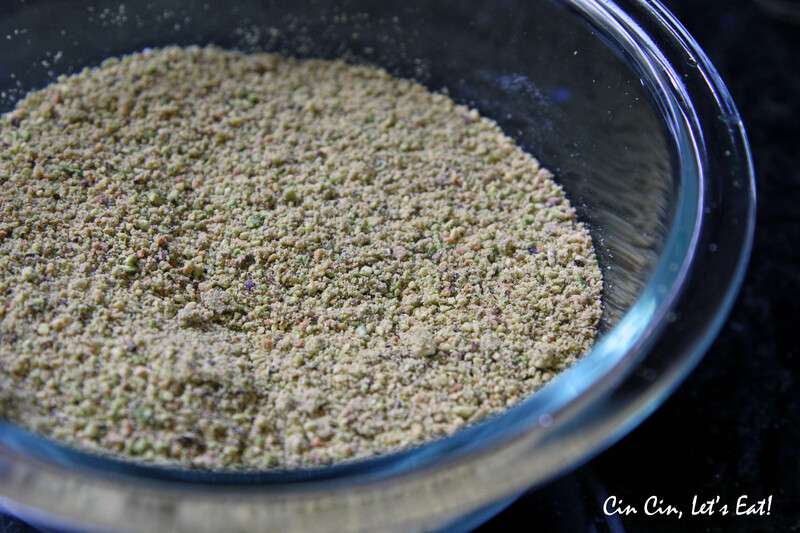 Sprinkle over the grated Asiago cheese and some fresh ground pepper. 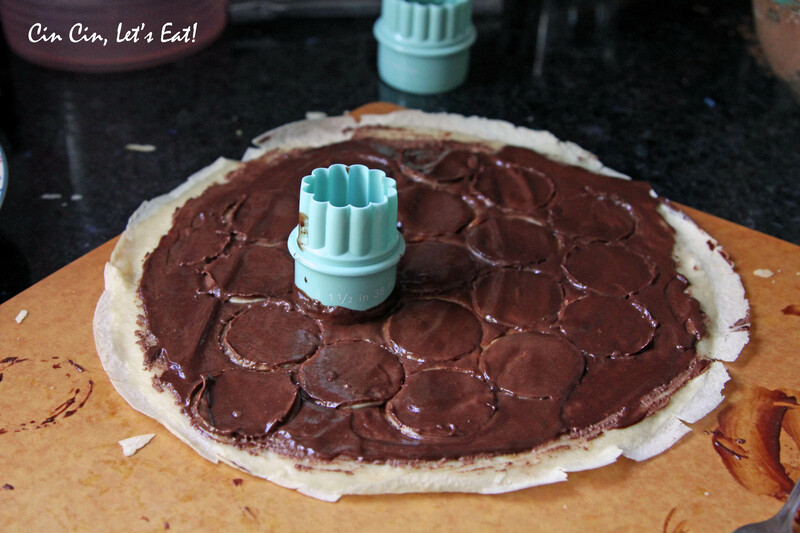 Fold the pastry edge over to create a border. Brush the pastry border with the beaten egg, bake for 25 minutes or until golden brown. 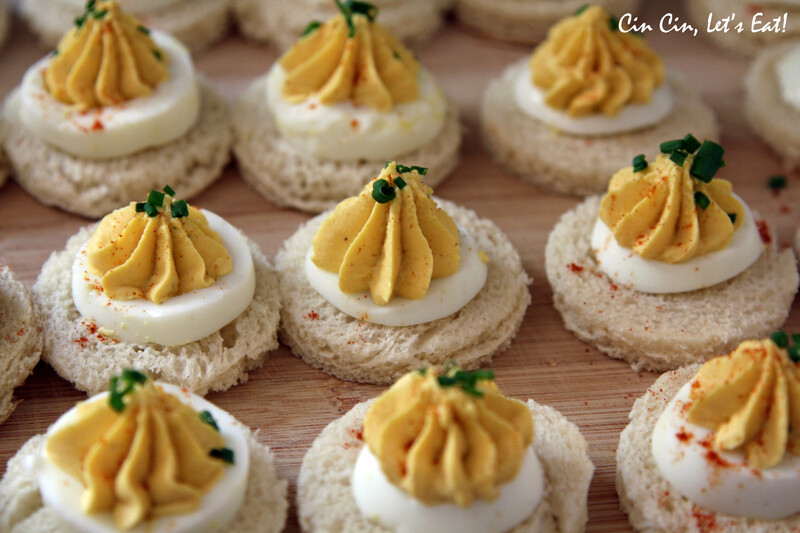 For the tea party, I decided to make these miniature size, cutting out small rounds using a 1-1/2″ biscuit cutter. But I gotta say, this cake was so good on its own, didn’t even need the sauce or the whipped cream! 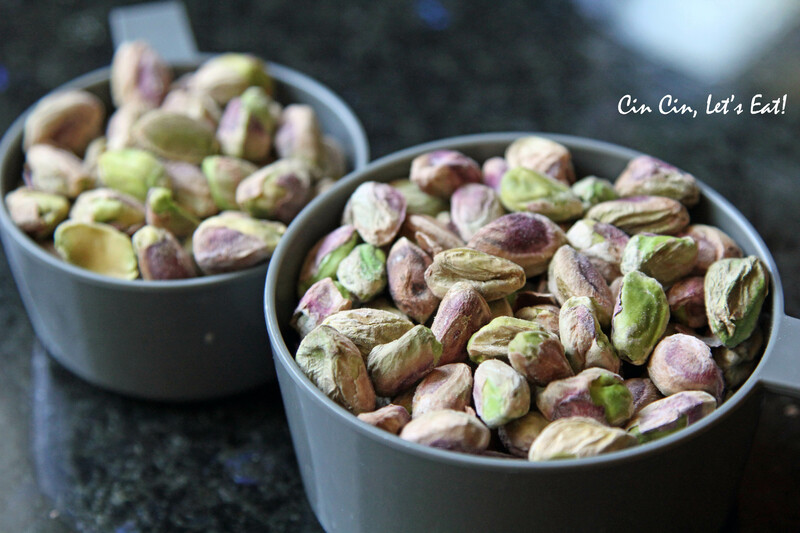 Yes, it’s important to use “salted” pistachios, as the slight hint of saltiness enhances the pistachio’s nutty flavor. And thank you to my husband who sat at the table for a long time to shell these, big kudos for only snacking on a small handful! Beat 1 cup of heavy whipping cream until soft peaks form. add in 1 Tbsp caster sugar and 1 tsp vanilla extract, beat until peaks are firm. 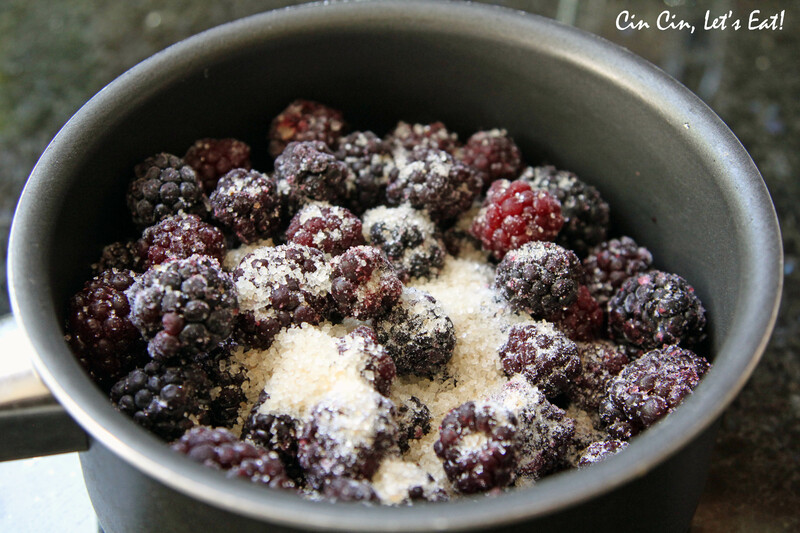 blackberry jammy goodness coming right up! To decorate, first frost the sides of the cake with chantilly cream (Don’t coat the top of the cake.) 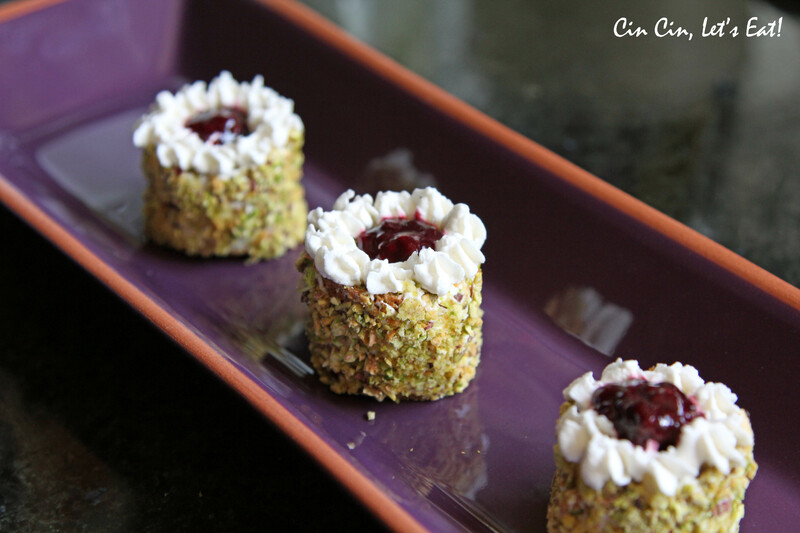 Roll the frosted cake in finely chopped pistachios until the sides are fully coated. 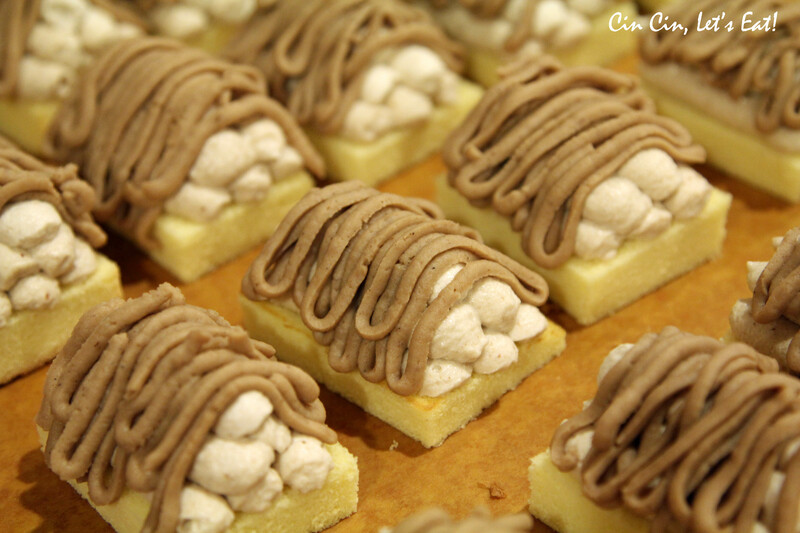 Then using a piping bag, pipe the whipped cream on the top of the cake, forming a circle. Spoon in a teaspoon of the blackberry sauce, the piped cream will serve as a barrier, preventing the sauce from leaking out. Refrigerate immediately until ready to serve. I had my first taste of a crepe cake in New York back in February (see post here), and have been wanting to make one since. It would’ve gone a LOT easier if I didn’t try to make them all miniature and cute. 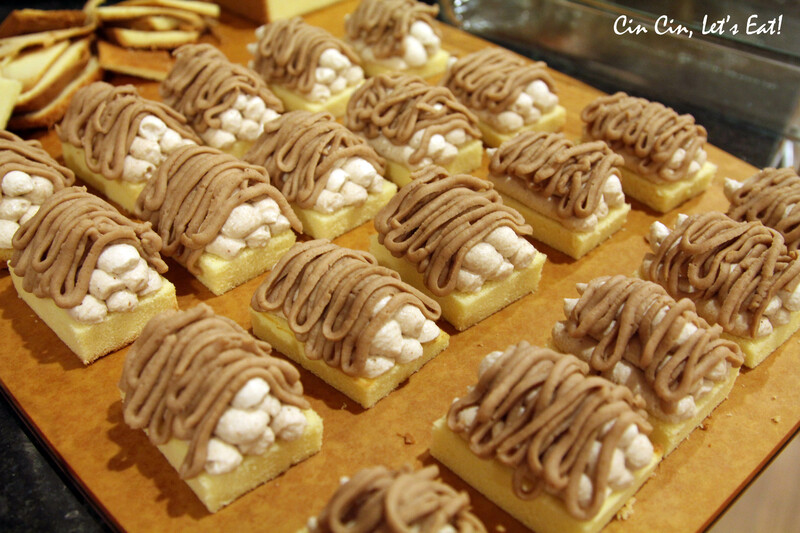 There was chocolate ganache everywhere…really, EVERYWHERE! But nevertheless, these were quite fun to make, and I will try to make a normal size one next time. To make it miniature, I spread the filling and ganache on the crepe first, then used a cutter to cut out individual rounds. A mini offset spatula was the essential tool and really helped saved my life here. 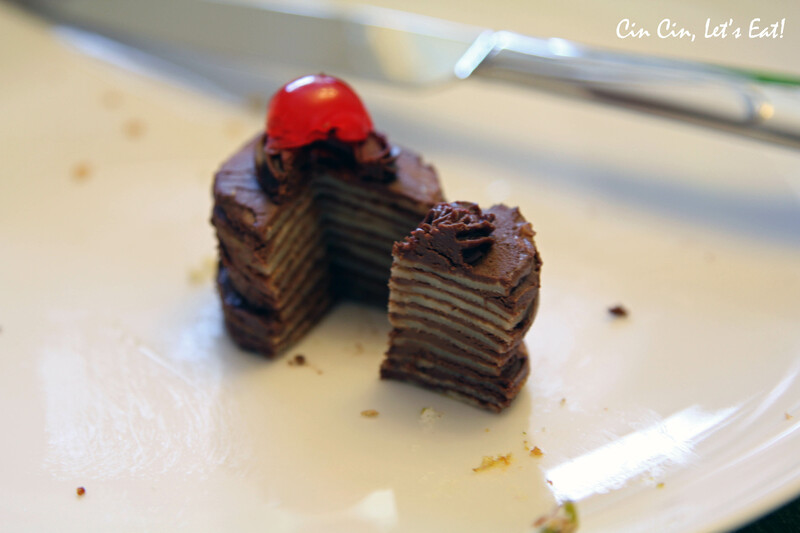 Each miniature crepe cake has about 10 layers. 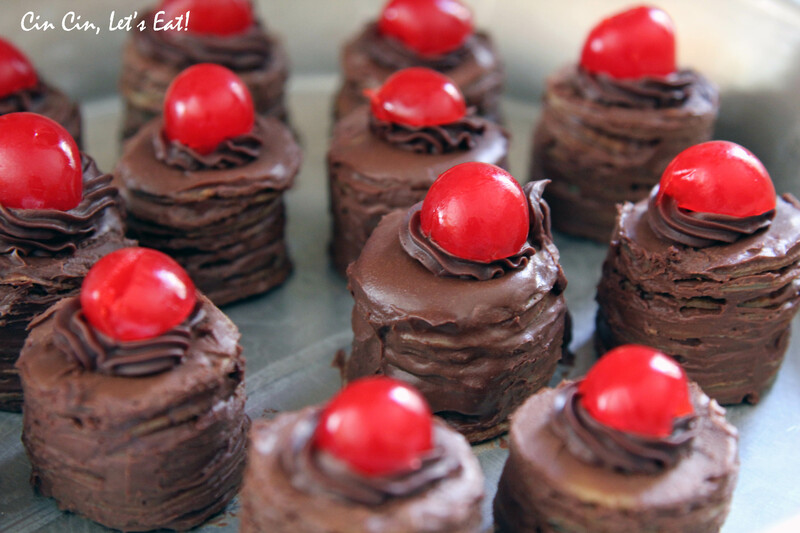 Once finished with the stacking, I coated each cake with more ganache, piped a little more ganache to hold a maraschino cherry in place. Voila! These were so small that I could’ve eaten the whole thing in one bite, but wait, I gotta cut one open and admire how pretty it looked! I’ll admit, sometimes when I put so much time and efforts into something so small, it hurts a little inside to see people just pop the whole thing into their mouths…all that work, gone in 5 seconds! Those of you who love to bake and decorate, you know what I’m talking about. Mont Blanc is a dessert that is dear to my heart. Growing up my family celebrated numerous birthdays with a big Mont Blanc cake, sometimes even a similar version made with taro instead. Mont Blanc means “White Moutain” (which is the highest mountain in the Alps). Just like the mountain, this dessert is covered with a dusting of powdered sugar (which, ironically, I forgot to do). 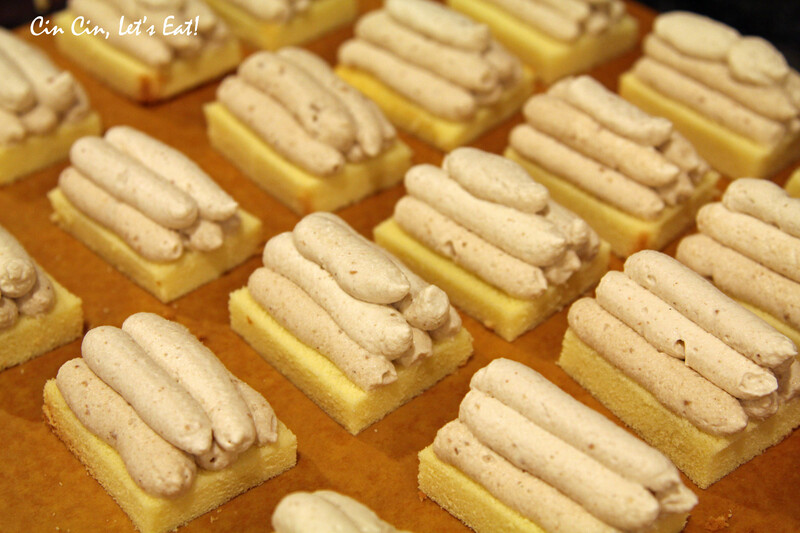 Genoise cake, chestnut cream, chestnut puree are the three main components of the cake. 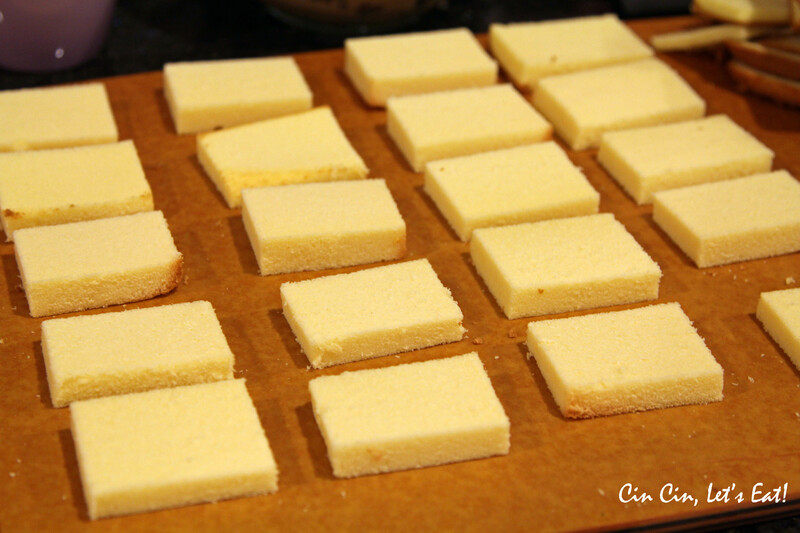 The Mont Blancs I’ve seen are usually round, but I liked Marc from No Recipe’s idea of making rectangular shaped ones. I already have a pile of trimmings from making the round open face sandwiches, the crepe cake, and the pistachio cake, I really didn’t need to add to that pile. Oh and I cheated and used the frozen pound cake from Sara Lee. I was afraid the buttery pound cake would be too heavy in flavor for this dessert but it actually worked out just fine! Hope you enjoyed this year’s tea party post. To see the previous parties, check out here, and here. Any suggestions on what to make for next year’s party? What a fun party! 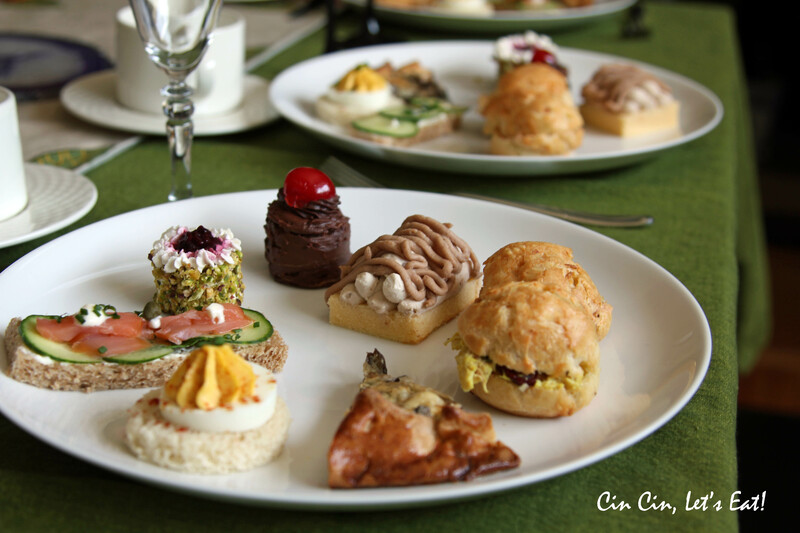 My husband and I have a tradition of celebrating our anniversary by going out to afternoon tea–there’s just something about delicate sandwiches and tiny tea cakes that makes everything special! 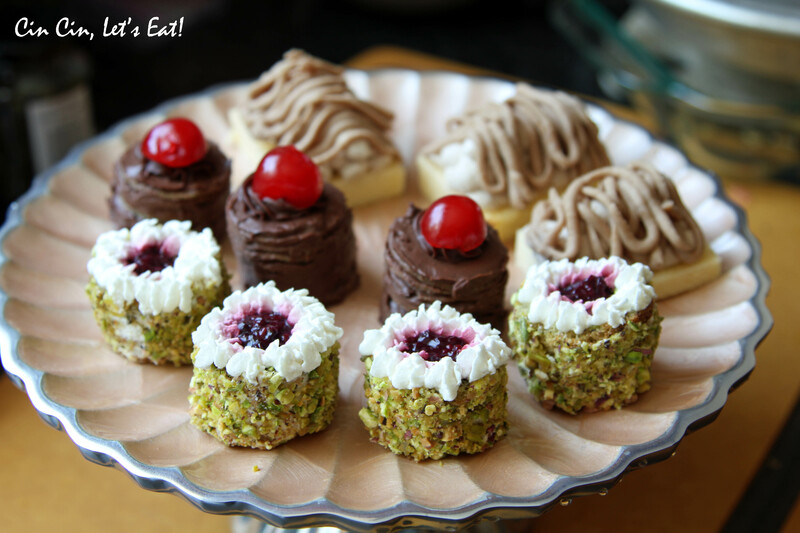 I love how you made miniature versions of the pistachio cake–what a great idea. 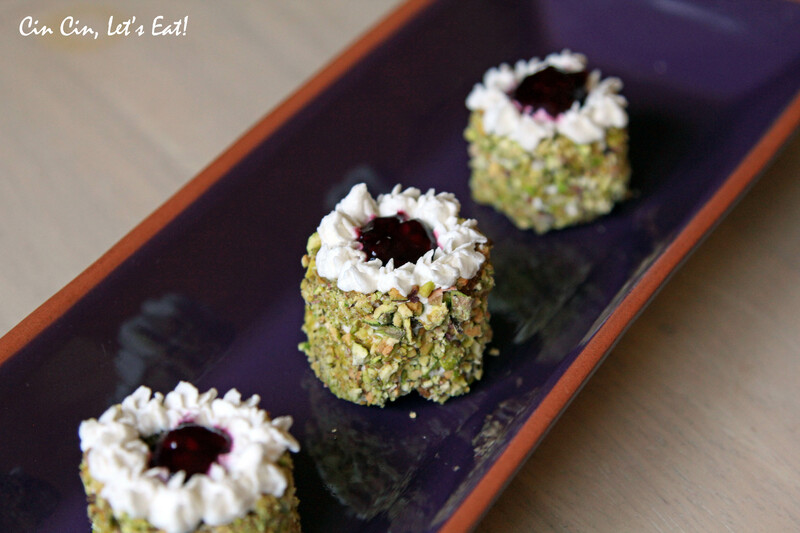 Pingback: Matcha Green Tea Cake with Chestnut Whipped Cream [recipe] | Cin Cin, Let's Eat! I need your contact please.